A collection of stories about the Warrnambool Fire Brigade, its members and their deeds. Warnambool writer Avis Quarrell has written a book about the Brigade. Its not a history book, but it covers the beginnings of the Brigade and many interesting aspects of Brigade life. Avis was assisted by Warrnambool Brigade Member Max Smart. Max acted as a liaison with Avis and provided her with information as required. Avis and Max are both involved in the Flagstaff Hill Maritime Village here in Warrnambool, and Avis expressed to Max her desire, if we wished, to write a book about the Brigade. The Brigade considered this and took up her offer. So it is a book about the Brigade written by Avis. 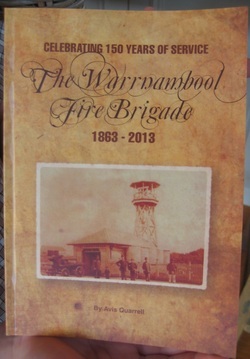 The Book is titled 'The Warrnambool Fire Brigade'. It's not a comprehensive history of the Brigade; it does cover some of our history, but it also contains a collection of stories about various aspects of the Brigade and fire brigade life in general. Avis's history is that she is 89 years old, and has for nearly 30 years written tourist directories and short history books. She is a very spritely and capable lady, and she put all her efforts into writing the book. The retail cost is $15. Flagstaff Hill Maritime Village, Merri Street Warrnambool Freecall 1800 556 111.